Hannington TV transmitter from the East, note the view from the North Downs. 2007 when this picture was taken ! 700MHz clearance occurred at Hannington in Apr 2018. It remained a B group (excl MUXES 7 & 8). Hannington transmitter reverted to a B group at digital switchover (in February 2012), though all of its digital output was within the B group anyway. It had originally been a B group before becoming an E group in 1982 when C4 broadcasts started. 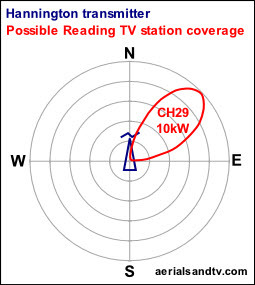 Being a main transmitter Hannington is horizontally polarised. Note the increase in transmission power at the 2012 digital switchover. 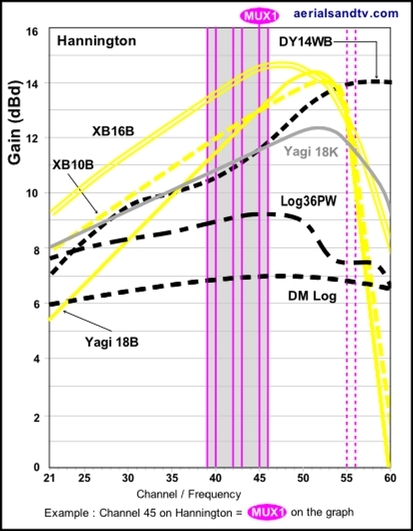 Nearly all transmitters increased their power by a factor of 10 at switchover, so, relatively speaking, Hannington`s increase was rather less than the others. But remember that the transmitter`s former easterly attenuation was abolished at switchover, so for that area a very big rise in power occurred. Also see Hannington`s nine smaller repeater transmitters. If the proposed Reading and Basingstoke local TV stations get off the ground their radiation pattern will planned to be as per the above graphics, i.e. not be omnidirectional. Both potential stations are designated phase 2, that is to say they`re less likely to ascend from terra firma than the phase 1 stations. Hannington`s population coverage is approximately 750,000 and it transmits to homes in many towns ESE of London including Reading, Newbury, Basingstoke and Winchester. It is often used as an alternative to Crystal Palace, Oxford, Guildford or even Rowridge transmitters. For Hannington we recommend the DM log for strong signal areas, the Log36 for medium signal areas, the Yagi18B and the XB16B for those with the most marginal signals. The dimensions and test performance of the aerials can be found on the relevant table. If requiring a “high gain aerial” in the loft we recommend the XB10B over the XB16B because the former aerial is smaller and it can be end mounted. See Hannington`s graph. 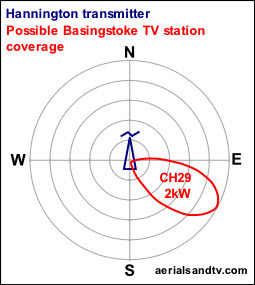 There is one “Local” channel allocated to Hannington, CH29, this is mainly used for local TV channels for Reading and Basingstoke (see below). All the aforementioned channels can be picked up by decent B group aerials. 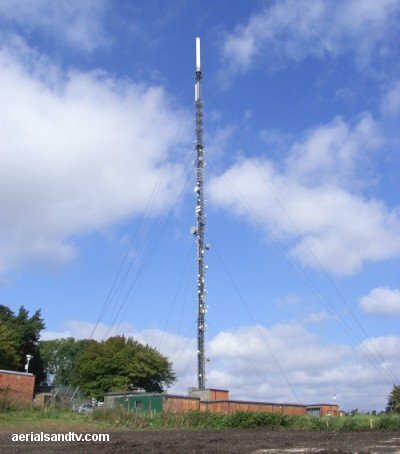 Hannington transmitter is situated 16 miles SW of Reading on the North Hampshire Downs and it was opened about 1970. 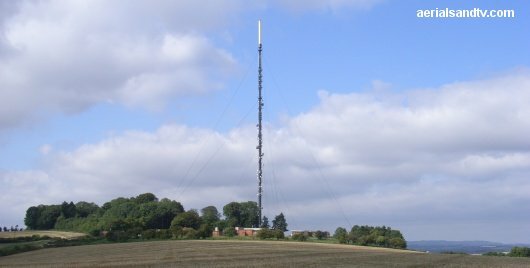 The site height is 217m and the actual mast is 134m high with the shroud covering the analogue transmitting array being about another 20m on top of that, thus the (average) transmitting height is about 369m, see How High is High ? The transmitter is actually about 2 miles to the East of Watership Down, as in the talking rabbits ! The nearest railway to Hannington is the (ex) L&SWR line from Basingstoke to Salisbury opened in 1854, and this runs about 4 miles to the South. Until 1964 there was a railway running North to South from Didcot via Newbury to Winchester. This line had a fascinating history as it was originally planned as a double track but only completed as a single line in 1885 then, because the line ran from the industrial Midlands down to the South Coast ports it became very heavily used during WW2 and was finally doubled between 1942 to 1943. Unfortunately its importance then diminished so greatly that by 1964 it was closed. However that was not quite the end of the story because the infamous Newbury bypass (that`s Swampy et al) was built on part of the ex railway lines trackbed. The actual section used was from Tot Hill to Enborne. 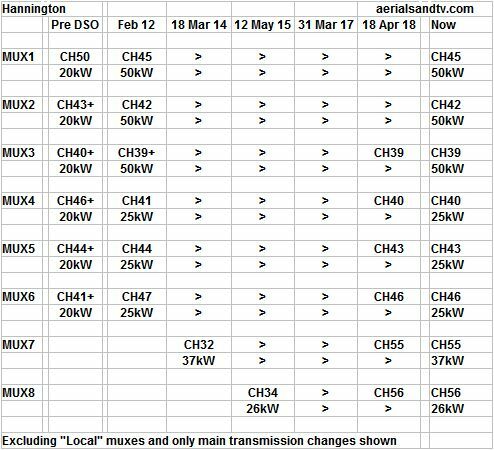 The channel guide below also includes the same information for other potentially co-receivable transmitters within the Hannington coverage area, namely Oxford, Crystal Palace, Guildford, Midhurst, Rowridge, Salisbury, Mendip, Ridge Hill & Lark Stoke. This information can be useful for identifying other transmitters which may give a superior signal. The channel allocation guides can also be very useful in the diagnosis of co-channel interference problems and can also be invaluable if you are trying to find a spare channel for a modulated output (e.g. for a Sky box or CCTV system) to be added to your TV setup/distribution system without suffering from co-channel. Also check Hannington`s nine smaller repeaters.